Last week you learned that creating a first small or limited online course is a great first step for your online teaching business. You learned about both beta and minimum viable products (MVP). 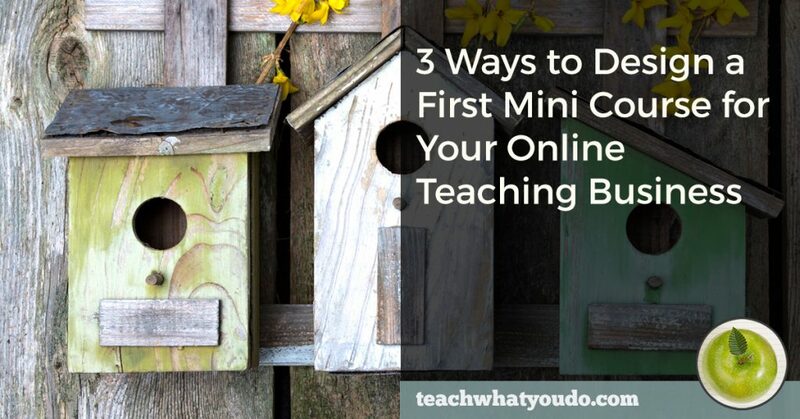 The question then becomes: what should your mini course topic be? Here are three approaches or types of mini courses–and brainstorming questions for each–that you can use to figure this out. These three types of courses are easy for a student to say “yes” to. What's more, they're structured to educate and inspire them to take additional steps–in the form of your subsequent classes. When you take the “getting started” angle for your mini course, you teach first steps and skills that get students moving TOWARD your larger course. As important as the “teaching” of these steps and skills is the motivation of your students to DO this work. It's important to foster momentum and enthusiasm for the subject in your students. How to set up your workspace, including best surfaces, lighting, and pics of workspace inspiration. Try this: first hand-lettering strokes. Know your style. Show stuents a variety of lettering projects (that you teach in your bigger or additional courses). Expose them to all that’s possible. At the same time encourage them to figure out what they like and prioritize which they’ll take on as they move forward. What tools (physical or virtual) do your students need? What working space (physical or virtual?) do your students need? What first skills or steps would they be excited and likely to try? Do these skills provide a natural segue to your paid course? What can you show peeks of in this course that's also a part of subsequent courses? Keep it “mini” and focused. Don't deliver so much they lose momentum or so that they don't need future courses. Be sure these first steps you’re teaching can be done easily and yield quick results. Be sure there’s a true connection between this content and the other courses you're planning for your portfolio. To create an “excerpt” mini course, take a sliver of your planned larger course and present a much shorter excerpted version. If you’re planning to create and sell a big signature course with multi-lesson modules, look through them to see what could be taught on its own. Later on you'll fold this excerpt into the larger class. If you're planning a “chocolate box assortment” to building your portfolio of classes (think Whitman's Sampler) you could excerpt one class OR take a small piece from several classes and combine those. Long ago, I imagined a series of courses that taught “go-to” scrapbook design foundations. There would be over 20 of these classes and each of them would have 4 lessons. So that's 80 lessons total. Knowing this, I immediately started making just ONE of the four lessons for each of FIVE of the classes. Those lessons are in a mini-course that I now give away, but that would have made a great paid mini course. Consider your planned future content you’ll be excerpting. Are there natural “starting points” within that content that could be excerpted? Are there distinct small pieces that would go together thematically? Are there distinct small pieces that would go together in a series? Make sure the excerpted pieces you use have unity. Make sure the excerpted pieces get your students taking actions that create momentum toward future study with you. With the “eye-opener” mini course you are addressing a need or problem or desire you’ve see in people who don’t realize your solution to their problem even exists. For example: they know they’ve got neck pain and are looking for solutions—a pillow, massage, stretching exercises. Through your mini course on reducing neck pain, you teach and move them toward your actual solution: pilates! That class is big and expensive, though, so you start the blogger with an “eye-opener:” How to Make Money with Your Blog. What is the solution your bigger course offers? Why do people need that solution? Go deeper than the obvious – what are the real underlying things getting them to look for a solution? These are usually things like status, money, time, health, love—as they relate to your topic. Who else (who doesn’t know about your solution) is looking for those same solutions? What can you offer as an umbrella topic that moves people toward your solution? Now you have a way to think through and choose one of three possible first mini courses. With this mini course you are making a first offer that you can put together easily and with which your students can get first momentum. This mini course is the beginning of your complete course portfolio. Click on the bar below to get a free guide to planning your complete course portfolio.